We didn’t meet Josh on this particular #looptheworld adventure. We met him on our last trip to Thailand in February earlier this year. However Josh is one of the beautiful people that we met on that holiday who inspired us to stat this column. We had just stepped off the airplane in Surath Thani, Thailand, which is not a glamorous airport and we were looking to book our ferry ticket over to Koh Tao. Alas, each counter that we went to were sold out. Standing in the line at the last counter we discussed that if we couldn’t get the ferry to Koh Tao we could head to Koh Phangan for the night instead. I mean, a night on Phangan is always a good adventure. We were interrupted by a tall handsome man standing behind us who commented on Simon’s guitar. The normal “oh you play guitar? Me too…” conversation followed and pleasantries were exchanged. Koh Tao, sold out. We purchased our tickets and a Phangan sticker was placed on our shoulder. With no accommodation booked and the full moon party only a few days away we did wonder if it was going to be difficult to find a place to sleep but didn’t stress on it too much because “the universe works wonders”. We’re piled on to a bus and drive for about 45 minutes. Anyone that has travelled will know as soon as you have had even one small exchange with someone it seems that the next time you bump into them it’s like seeing an old friend. At the dock Simon, Josh and I got chatting about our travels, music and life. A few beers in and we’re on the ferry bound for Phangan. A few more beers and we’re talking religion, philosophy and music and just for good measure we talk a little more music. I love those moments, which seem to happen more frequently whilst travelling, where there is an instant connection between people and it truly does feel like you are old friends. By the end of the ferry ride Josh had graciously offered us a bed in his room and we were all looking forward to a night out on the infamous Phangan. 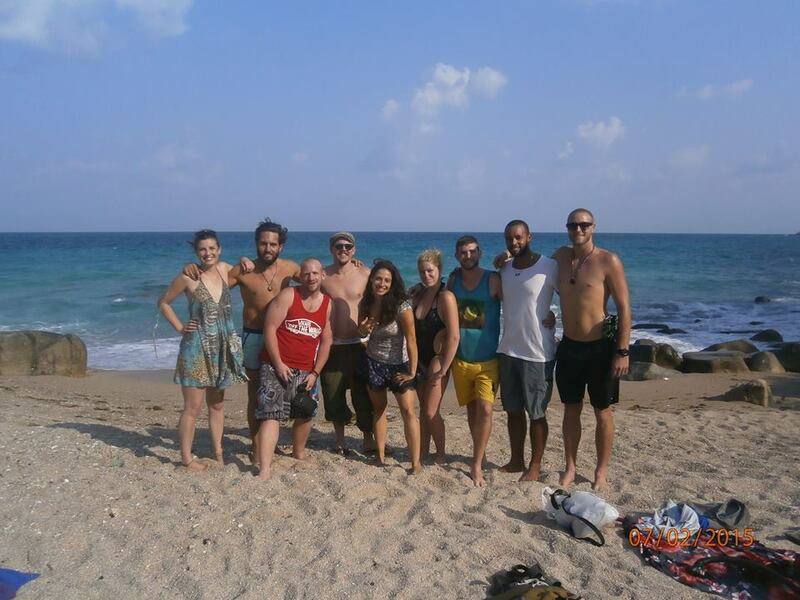 We were sad to leave Josh the next day but managed to convince him to come to Koh Tao after the full moon party. From left: Hannah, Josh, Terry, Simon, Lia, Tanya, Reeve, Ethan, Jordan. Josh is one of those magnetic people that you meet who are happy and comfortable within themselves and so always attracts other good humans. 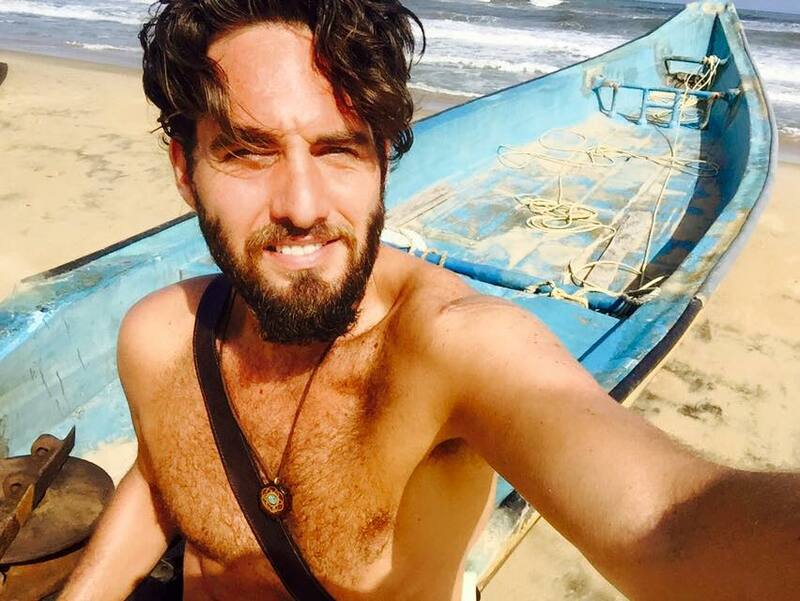 When he arrived on Koh Tao a few days later of course he brought with him more lovely friends who he’d just met. For the next few days we explored Turtle Island via scooter, snorkel and foot. Josh is a musician, photographer, videographer and film maker. When we met him he was on his way home from a pilgrimage style trip in India were he traveled to small towns and large cities filming a documentary on Indian music and learning as much as he could. I’m really looking forward to the finished product. Josh generously suggested that he make a video clip for Simon. One night at Fishbowl Beach Bar we filmed a set with one GoPro and one DSLR. He edited the clip upon his return home in New York. This is what he created. Enjoy! Thank you so much Josh. We are so pleased that we met you and look forward to more adventures somewhere else in the world.